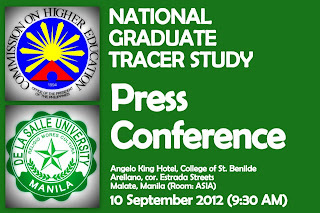 The national Graduate Tracer Study (GTS) 2012 is a project of the Commission on Higher Education (CHED) through the De La Salle University Manila, that seeks to provide information on the employability of college graduates in the country from 2006-2010. The study will be conducted via an online survey facility involving about 58,000 graduates from 838 Higher Education Institutes (HEIs) all over the country. Now on its third leg, CHED hopes get 58,000 respondents this year. It has implemented two other surveys in 1999 and 2004 in line with their mandate to monitor the performance of programs in the higher institutions of learning. Unfortunately, the results were not significant due to low number of respondents. 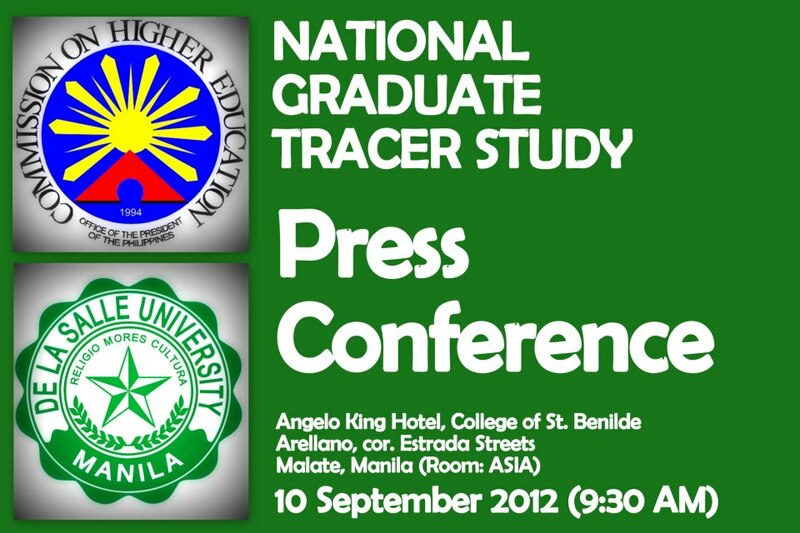 A Press Conference was held last September 10 at the Angelo King Hotel, DLSU College of Saint Benilde, Arellano cor. Estrada St., Manila. 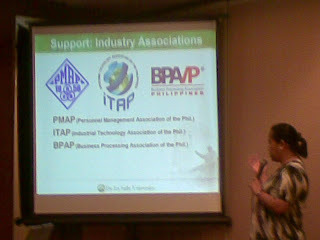 The event was attended by project personnel, researchers, and collaborators who gave information on the project background, what project aims to do plus its implications to stakeholders. Recognizing the role of social and the traditional media in dissemination of information, the said press conference is seeking support from media to encourage all identified participants to take the survey. Commission on Higher Education (CHED), in partnership with the College of Education of De La Salle University, is appealing to bachelor, masteral and doctoral degree graduates of Philippine colleges and universities from 2006 to 2010 to participate. It takes only ten (10) minutes to complete it. The online survey that will run up to end of October 2012. 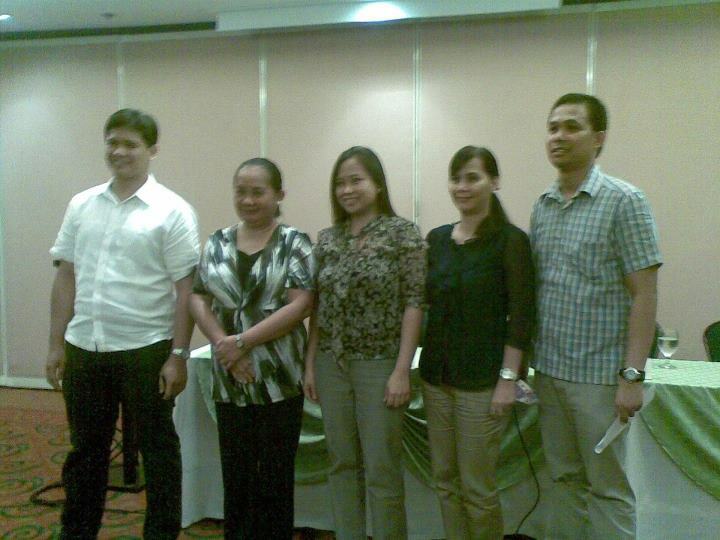 The GTS results will help the CHED to examine the effectivity of higher education and academe policies. It seeks to bridge the gap between graduates' skills, values and training vis-a-vis the prevailing job offers and industry needs. There seems to be a mismatch between the graduate pool and what the Philippine industry wants. And this leads to the persistence of unemployment and underemployment problem in our society. The survey would provide data that CHED can use to institute necessary reforms and policies to ensure that future graduates are prepared to meet the challenges of the 21st century. 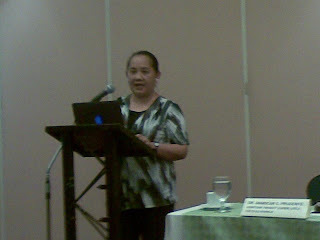 Let your opinions be heard and you do our future generations good. Please support this noble undertaking. 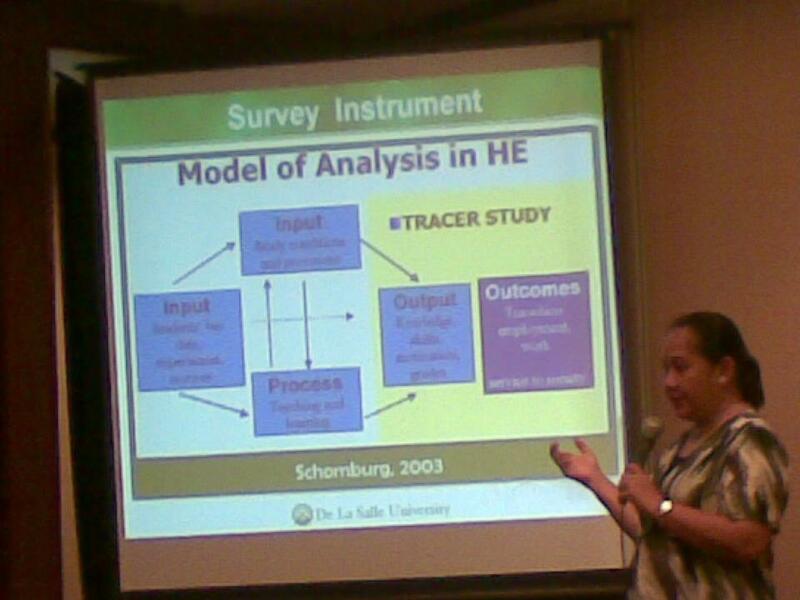 It's good that CHED is doing this research to "examine the effectivity of higher education and academe policies". After the study, will the results be available to the public? If yes, where can we see it. It was mentioned that this is the third leg, what happened to the first two? 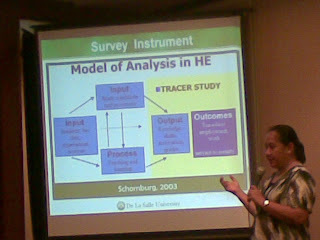 The results of the first two surveys are not significant with the small number of respondents. Hopefully with your support, we would be able to make this a successful one.